What's the Best Part of Being a Priest? I Can't Tell You. In the Archdiocese of Boston, Tuesday of Holy Week is the day when all of the priests gather at the cathedral for the Chrism Mass. Today, I attended the Chrism Mass and was grateful to spend that time in the company of some great priests. Also, one of the students from the BU Catholic Center attended the Mass as well. His effort to attend the Mass and his presence there was something joyful for me. After the Mass, I had lunch with a few brother priests and again was joyful for their fraternity. Afterwards, I came back to the BU Catholic Center and had Mass with our students and then had supper at our weekly spaghetti dinner. The best part of the day, however, was this evening. Four priest friends and I heard confessions. There were lots of confessions. Non-stop confessions. As I looked around, I was really happy for everybody. I was happy that these students were receiving the grace of the sacrament and encountering the Divine Mercy. I was also grateful that they were encountering great priests. I always feel like I am doing a tremendous service to the Church when I expose people to priests who are truly great. It makes me really happy when lay people tell me how much they love the priests whom I introduce to them. But, I was also happy for the priests. Hearing confessions in a situation like that is simultaneously exhausting and life-giving. It is in these moments that you feel most like a priest. You feel like, "Yeah, this is why I am a priest." And, despite the fact that trying to find parking near Boston University is a total pain, these priests keep coming to help out. They brought to the students what only they can bring. No one else can do that! And the students . . . it's just great. As I was hearing confessions and scanning the chapel, I saw Camille playing the piano. Her job is to make sure the music is prayerful and sufficiently loud enough so that the confessions can't be overheard! She played for 90 minutes straight and made it obvious that her playing is also her praying. Also in the chapel was Bobby--our intern--who directed people to the priests and--as he does with everything else--kept everything running smoothly and joyfully. At the back of the church was Wesley, one of our FOCUS Missionaries. He is a master of making people feel joyful and welcomed. He warmly greeted people as they came in and practically congratulated them when they left! The Lord says that there is more rejoicing in heaven over one repentant sinner than 99 who have no need of repenting. Wesley brings that heavenly reality down to earth every time we have an evening of confessions at BU. He truly rejoices. We heard a lot of confessions tonight. I've never thought about this before, but what a priest does in the confessional is a beautiful sacrifice. How so? The hours spent hearing confessions are some of the most amazing, beautiful, and powerful moments that a priest will ever experience. But, they are moments that will never be shared again. In fact, those graced moments are left there in the confessional once we take off the purple stole and step out into the world again. On nights like this, when priests are saying goodnight to one another, there is just a profound gratitude and silence. Perhaps we say things like, "What a great night," or, "This was really beautiful." That time in the confessional--the time when we often feel most priestly, most used by God, most profoundly astounded by our vocation--is offered totally to God and for the salvation of souls. The very best moments of our priesthood will not be recorded in our memoirs, shared in confidence to even our closest friend, or even revisited in our own meditation. This is what I mean by it being a sacrifice. That time is given over completely to being used by God for the salvation of souls. It is time that is never ours again. And, isn't it beautiful that it is the time that is totally sacrificed that becomes the most fulfilling time in our priestly life? It goes to show that what we offer to God in sacrifice never takes happiness away from us, but rather brings us to true happiness. The Sacrament of Penance . . . it is totally awesome. When I first started writing this blog, it was for the purpose of sharing my experience as a priest. My experience does not occur in an abstraction, but rather in particular places, at particular times, with particular persons. I don't want my witness to Christ to be theoretical because my experience of Christ is NOT theoretical. I've mostly looked at this blog as an opportunity to share my concrete experience. If this witness is of help to somebody else, I am happy for that. When I write glowingly about my previous parish or about the young people here at BU, I don't do so not to suggest that they are better than anyone else. I do so because it is in the midst of these particular people that I encounter Christ. I write about them because this is where Christ has placed me and this is where I am moved by Christ. If, for instance, one met the Man Born Blind from the Gospel or Lazarus, we would not really want them to tell us about the theology of miracles. If we met them, we would say, "Tell us about the day you got your sight!" "Tell us about the day you got raised from the dead!" So, though not quite the experience of going from blind to sight or from death to life, I nonetheless want to share what my experience of Holy Week is going to be this year. On the eve of Palm Sunday, I drove to a retreat house where forty-one young men were attending a discernment weekend hosted by the Archdiocese of Boston Vocation Office. Cardinal Sean O'Malley was leading the retreat. Six of the attendees were from our Catholic Center at Boston University. Although I met a few of the other attendees, I really only know the BU guys well. What struck me about them is the fact that they went on this retreat together. They have a friendship together. They are growing in their Catholic manhood together. They encourage one another. There is a joy in them. I was touched by this. My encounter with Christ does not occur in the abstract. It occurs in the friendship that is lived in our community together at the BU Catholic Center. I am moved by what Christ is doing in our midst. I have been and will be moved this week by the great desire for holiness that will fill the hearts of the people entrusted to my pastoral care. It's a beautiful gift as a priest to have the privilege of encouraging those who are struggling with sin and temptation. Their desire for holiness moves me to desire greater holiness. Total gratitude. This evening, I joined our RCIA for dinner at the Catholic Center. They've been meeting all year and are now at the threshold of the Sacraments. At the Easter Vigil I will baptize and confirm five of them and will receive several others into the Catholic Church and confirm them. How awesome is that?! What is particularly moving to me about these numbers is that we can't claim credit for them. Somehow, these people just found their way to us. In other words, their presence here is not because "we've done something." Their presence is just a total grace and a sign that Christ is doing something. Last night when I went to that discernment retreat, I was really happy when I looked around and saw the great priests who were there helping out. Again, these guys are evidence that Christ is doing something. On Tuesday of this week, I will attend the Chrism Mass with all of the priests of the Archdiocese of Boston. I will see a priest with whom I lived for three months when I was just three years ordained. He's the pastor of a great parish called St. Agnes in Arlington. He is a GREAT priest. I don't see him as often as I would like, but I will be moved--once again--just to talk to him and recall his priestly friendship and example. 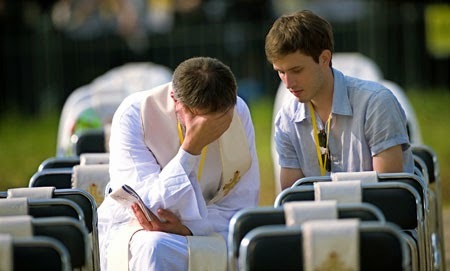 I will see priests who I knew when they were seminarians who are now setting the world ablaze. I will see . . . well, I could go on and on with this. Basically, I will be moved by the example of some wonderful priests. On Holy Thursday, I will be moved by the example of the Eucharistic Procession from the campus chapel to our Catholic Center. Then, I will be moved as we process several miles to the Cathedral to join the Cardinal for Night Prayer. On Good Friday, I will be moved as Fr. Rick (a Franciscan priest who assists us) and Deacon Chris (a Jesuit scholastic who serves with us) lead our students and me to the adoration of the Cross. For the past few weeks, one of our students has been home because her father is gravely ill. Tonight, I was moved by the great love that her friends in the Catholic community have for her as they pray for her and her father and as they worry about her. My experience of the priesthood and of the Christian life is an experience of continued surprise. I stand in awe at all of the beautiful things that Christ is doing in our midst. You can't really plan for a man born blind to receive his sight or a man to be raised from the dead. You can't really plan for a sinner to come to repentance and being transformed. You can't really plan for someone hearing Christ calling him to be a priest. You can't plan for people to love one another. As a priest, what I can do is be faithful to the movement of God. When I see Christ doing beautiful things in our midst, I can allow myself to be moved by them. And, in being moved, I can attract others to be moved. In the end, it is all very humbling isn't it? We don't build anything. God does something awesome and it moves us. It moves us so much that we talk about it, live out of it, and share it. Then, others are moved and talk about it, live out of it, and share it. This is how the Gospel was first preached. This is how the Gospel is still preached. This week, this priest is encountering Christ in the friendship of our Catholic Center Community. This encounter moves me and fills me with conviction in Jesus Christ. In many ways, priesthood for me means that I am the one who is filled with the greatest wonder at what Christ is doing. I am the one who is the most surprised, the most moved. God calls his priests to be men filled with wonder. He calls us to echo the words and disposition of Mary, the Mother of Priests: "The Almighty has done great things for me and Holy is His Name." 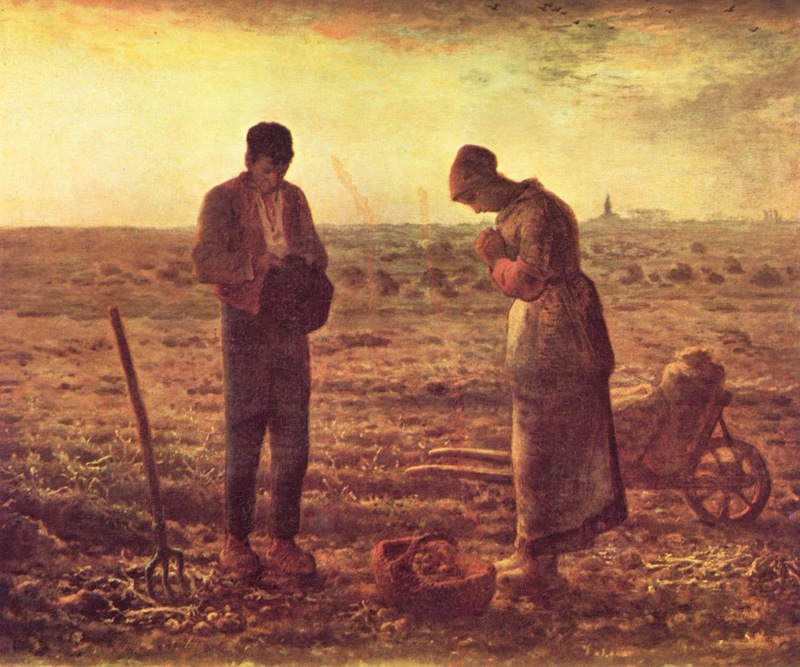 One of the things that I inherited when arriving at the BU Catholic Center a couple of years ago was their custom of praying the Angelus before Mass. For me, this prayer is always a moment of profound gratitude. There are approximately forty thousand graduate and undergraduate students on the move here. They are moving from lecture halls to labs, from freshmen year to senior year, from the present to the future, and from academia to careers. They are also moving from belief to unbelief, from one political ideology to another ideology, from confusion to clarity, from clarity to confusion, from all kinds of (healthy and unhealthy) relationships, and from one emotional state to another. Every day at 12:29 (a minute before our Mass) our students come to a profound pause and live together the memory of the Incarnation. "The Word became Flesh and dwelled among us." Friends of mine from the ecclesial movement, Communion and Liberation, always say "And dwells among us," and I prefer this. It makes clear that what happened in that moment of Mary's "Yes," is not imprisoned in the past. Instead, her "Yes" still echoes in the lived experience of the Church. He dwells among us. Through Mary's obedience, something new has entered into the experience of time. In our life together as the Church, we encounter the presence of the eternal. Were it not for her "Yes," we would be the prisoners of the ephemeral and the slaves of existential loneliness. Our memory of this moment two thousand years ago is not something that simply acknowledges a fact that happened. It indeed does that. But, it acknowledges with profound gratitude and humility that this fact in history is lived now in the experience of our friendship together. Her "Yes," to Christ gives us the freedom also to say, "Yes." In a sense, we are living together the memory of that "Yes." We are caught up in that moment when time and eternity meet. We pause before the great Mystery of our salvation and this lived memory allows us to see that every minute of the day is now a moment with Christ. All time belongs to Him and all time is now saved by His Presence. This brief moment together of awe before the Mystery fills me with gratitude. Gratitude, of course, for the "Yes" of Our Lady, but also for how that "Yes" continues to live in the experience of the friendship of the Church. Without this pause each day, the Church risks becoming a business, a corporation, an ideology, or a club that has no real purpose or impact on the lives of its members. It is this pause that awakens in us a certainty that something new has happened and is still happening. It is this pause that causes me to see that Christ is present here in this place. The memory of the Annunciation daily renews in me an affection for the people with whom I live this memory. These young men and women who stand with me in awe before the "Yes" of the Blessed Virgin are an assurance of something truly beautiful and something that daily saves me: "The Word became Flesh and Dwells Among Us." Psalm 16 says, "He has put into my heart a marvelous love for his faithful . . . ." For me, this is priesthood. 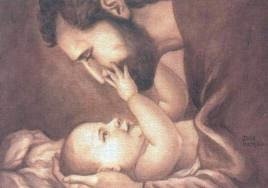 Today, on the Solemnity of St. Joseph, this marvelous love was renewed in me. Tonight, as I go to bed and think about the faithful, I'm just humbly grateful. He has indeed put into my heart a marvelous love for his awesome people. We had a great day today at the BU Catholic Center; prayerful, educational, and fun. God pours into the hearts of His priests a marvelous love for his people. For the past two evenings, I've been preaching a parish mission at St. Mary of the Annunciation Parish in Dedham, Massachusetts. 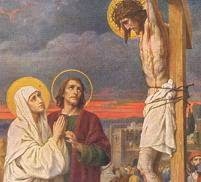 My reflections were based upon the Stations of the Cross. For me, preaching the mission provided me the opportunity to spend a lot of time reflecting on the Lord's Passion and Death as I prepared to preach. But it also provided me the opportunity to see two good priests--the pastor and the curate--doing such great work. The parish itself has always had a great reputation in our Archdiocese and it was great to be with the people there. In a particular way, the parish is known for its excellent youth ministry program. The students at BU are on break this week, but I've been there getting work done AND enjoying the quiet building! Two of the students who are hanging around Boston this week have been joining me for Mass each day. We've also found ourselves engaged in some solid theological discussions. For me, the true face of the Church is discovered in moments like these. We've attended Mass, eaten burgers, discussed theological questions, and have bantered back and forth a bit. Not that I need convincing, but I do need continually confirmation that friendship is the key to the life of the Church. This week, such confirmation was given in seeing a brother priest thriving in his pastoral ministry and in praying, dining, and hanging around with these students. 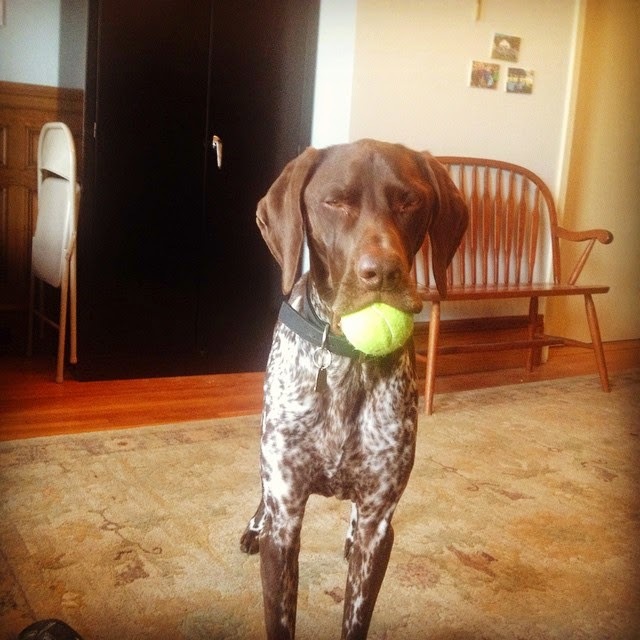 One of those students and one of our staff at the Catholic Center have generously offered to watch my dog from Wednesday until Sunday so that I can go on retreat. I am the beneficiary of their charity. I am grateful that their generosity allows me to go and pray for a few days. I hope that five days at the monastery will make me more charitable in return! In any event, these days I am reminded (all over again) that the Church works best when we live it as a friendship. If the Church is lived merely as a bureaucracy, as a series of programs, or as a superficial series of planned social events that never deal with the truly profound questions of the human heart, then it withers and becomes lifeless. The Church has to meet the human heart and cause it to awaken. I'm feeling grateful for the people who reveal the face of Christ to me through the friendship we share in the Church. They continue to allow me to be surprised by Christ. And, it gives me joy when through our communion together, they also experience the continual surprise that is life in Christ. This week, I once again experienced the newness of Christianity. This morning I drove into the BU Catholic Center with a seminarian who is staying with me this week while he is on Spring Break. He graduated from BU last year. Our first event for the day was Men's Group. The Men's Group that is run by a couple of students and under the direction of our intern Bobby meets on Sundays and Thursdays. On Thursdays they hang out, eat burgers, play video games, and do fun stuff. On Sunday mornings, after eating doughnuts, they have a short talk and then pray together. Today, one of the students gave a talk based on something that Pope Benedict XVI had written on the Eucharist. It was solid food. After that, we all prayed the Rosary together. It was impressive to glance around the chapel and see 16 young men praying the Rosary together. After Men's Group, we headed over to the 12:30pm Mass. Although God obviously is always doing something awesome at every Mass, sometimes that awesomeness is more palpable. Today was one of those days. I just had this tremendous sense that God was touching us today, revealing his Glory, and helping us to follow Him. Yeah, something was happening today. There was just an outpouring of grace happening. The Gospel for today was the Transfiguration. I mentioned at Mass how a few months ago, a young boy from my previous parish emailed me with a good theological question. "If baptism washes away sin, why do we still sin after we're baptized?" That's a pretty good question coming from a seven year old! His question is a fitting one for today's readings. Although the guilt of sin is washed away in the waters of baptism (and through Sacramental Confession), the wounds caused by sin still remain. The wounds of sin hinder us from seeing and judging reality properly. This is, in part, why we are attached to transient things and why we forget about God. Our wounded intellects hinder us from judging things properly. How do we heal the wound left in our intellects? Today's Gospel shows us and tells us. The disciples were about to see some horrible things. They would see Jesus humiliated, scourged, beaten, crucified, and killed. He would appear to be a complete failure. 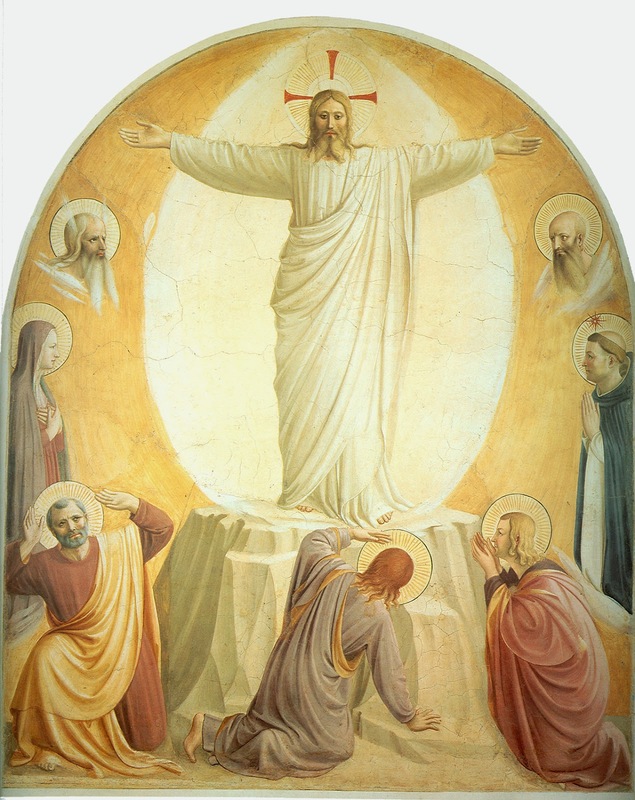 But, in the Transfiguration, his Divine Glory shines through his humanity. Jesus is not just another good guy who ends up in a bad way. He is God. To help the apostles to see and judge Christ's suffering and death appropriately, Jesus reveals quite powerfully his divinity. And, God the Father testifies, "This is MY Beloved Son. Listen to Him." How do we heal our intellectual blindness? By the purifying light of Faith. And how do we grow in Faith? By listening to Christ. Our wills and passions all need to be purified and healed. But, today is a good day to focus on our need for intellectual healing. The more we profess Christ's divinity, listen to him with humility, and judge our life according to his Word, the more our spiritual blindness is lifted and we see and know the world as God sees and knows the world. We can grow each day in Faith and this growth in Faith heals the blindness of our hearts. The more we grow in Faith, the more we come to recognize a very fundamental truth that spiritual blindness often hinders us from seeing: Jesus is God. I am not God. After Mass, I returned to the Catholic Center and am now sitting in my office listening to a couple of dozen students meeting downstairs with our FOCUS Missionaries. One of the students is giving a witness about how God is working in his life. At a university this size, I certainly wish that there were thousands more involved in our Catholic life together. But, one thing is certainly true. The grace and life contained in one mustard seed is more powerful than all of the evil in the entire world. The fact that 16 guys show up to pray together on a Sunday morning is awesome. The fact that students show up for Mass, desire to grow in holiness, seek the Sacrament of Confession, pray, and witness to one another . . . pure awesomeness. Today, all of us climbed up the mountain with Jesus and He has revealed to us His Glory. He has reminded us that He is God. He has shown his divinity to me today by the outpouring of his grace into the humanity of these young people. I find it very moving that these young people have a desire to grow in they're discipleship. They are hungering to learn how to pray, to deepen their Faith, to go out into the deep. It's also a great blessing that the Church is responding to the desires of these young people by providing a Catholic Center and a Catholic liturgical life on campus. Thanks to all of those who support us through your generosity to our ministry and through your prayers. God is doing something beautiful among the young people here.